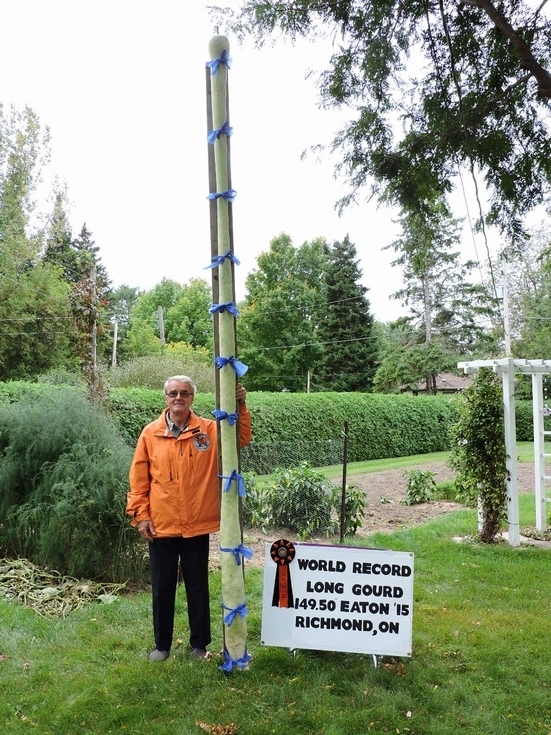 2015 - Al Eaton and his 149.50 inch World Record Long Gourd! BigPumpkins.com congratulates Al Eaton on his 149.50 inch long gourd measureed at the Bracebridge Agriculture Society Fall Fair/Horse Show. Al grew his record long gourd on the 139.25 Ansems 2013 seed and crossed it with his own 122.88 Eaton 2012. If you were lucky enough to see this long gourd and take a digital picture please upload to the Photo Gallery (not your personal diary) to have your photo included on this page!